The human body channels energy (chi) along meridians, or pathways. These meridians have both yin and yang components, based on the direction of the energy flow on the body. Chi (pronounced chee, also spelled qi or ki in Japanese shiatsu) is the fundamental life energy, and it travels through the body in channels called meridians. 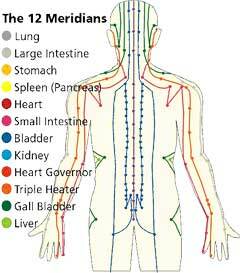 There are 12 major meridians in the body that transport chi, corresponding to the 12 main organs categorized by Chinese medicine. The meridians are channels which are 20-50 mill microns in diameter. They have a thin membranous wall and are filled with a transparent, colorless fluid. Each of the main meridians intricately develops subsidiary branches, some of which supply adjacent areas with energy while others ultimately reach the surface of the skin. The places at which the branches reach the skin`s surface are the acupuncture and pressure points. Several channels may converge at one point; therefore it is possible to affect several meridians at one time. The meridians cannot be seen with the human eye but scientists have been able to precisely map these energy channels or meridians using sensitive electronic instrumentation. In addition, there are two single meridians following the midline of the body, one at the front and the other along the spine. Many points are distributed along the meridians. These points are essentially transformer stations through which bio-energy flows into the muscle structure to allow organized activity to take place. In disease, imbalances develop in these energy flows, causing some of the transformer points to become irritated or congested. This results in pain or weakness in the surrounding muscles. Stimulating these points with special needles (acupuncture) or pressure (acupressure) helps to normalize impaired conditions. In addition, you may use electro-acupuncture to treat points with a weak DC current. Electro-acupuncture instruments are relatively cheap and easy to use. These meridians have both yin and yang components, based on the direction of the energy flow on the body. Chi (pronounced chee, also spelled qi or ki in Japanese shiatsu) is the fundamental life energy, and it travels through the body in channels called meridians. There are 12 major meridians in the body that transport chi, corresponding to the 12 main organs categorized by Chinese medicine. In addition, there are two single meridians following the midline of the body, one at the front and the other along the spine. Many points are distributed along the meridians. These points are essentially transformer stations through which bio-energy flows into the muscle structure to allow organized activity to take place. In disease, imbalances develop in these energy flows, causing some of the transformer points to become irritated or congested. This results in pain or weakness in the surrounding muscles. Stimulating these points with special needles (acupuncture) or pressure (acupressure) helps to normalize impaired conditions. In addition, you may use electro-acupuncture to treat points with a weak DC current. Electro-acupuncture instruments are relatively cheap and easy to use. How to find or locate acupressure points? There are many online sites with images showing the position of acupoints and meridians on the body. After getting the body or body part image, you can get an idea of the location of a specific point. You can work most of the important acupoints by simply searching them out with your fingers. As you press into these areas, you are looking for the tenderest or tense areas. When you find them, squeeze or press gently but firmly in the area until you feel a change in the pain response, then move on. Even acupuncturists palpate an area for a tender spot for more accurate point location during acupuncture treatments. Points are typically in a dip rather than a bony protrusion. Tip: If a point is sore, it needs work. You should feel sour or numb, but not knife-cut like pain when pressing. The acupoints are usually between or beside the bones and tendons or ligaments, on in a depression, never on the bones or blood vessels. If a point is not sore, leave it alone. Finger pressure will work but most people get a better Healing Response using acupressure tools. They allow more pressure to be applied with less work, stress and potential damage to the massager. If a point is very sore, press only as hard as you can tolerate do not overdo it this is not a contest. Light pressure for a longer period will give you the same results. Some people who are larger or less sensitive than others, may need more pressure to activate the healing response. You can learn the basics of acupressure at home. Visit free websites such as acupressureonline.org. You can get basic instructions for different acupressure techniques. Read books about acupressure. Most books offer detailed illustrations to find potent points for treating hundreds of ailments. Watch instructional videos on acupressure. You can purchase them at any health food store or watch them for free on Youtube.com. * How to get Diagnose and Healing with Acupressure?